As some of you may know, Colorado was my home for many years. I spent many mornings driving to work with picture-perfect scenery just beyond my windshield. Painted here is a very familiar scene to me–the Front Range rising up from the eastern plains, with Pike’s Peak at its apex, shrouded in clouds….or covered in snow, or wrapped in the sunrise….Needless to say, I took lots of pictures, even from the front seat of my car. Pike’s Peak stands at 14,114 feet, a far cry from the elevation of my current home at 23 feet. Pike’s Peak is the famous place referred to on all those covered wagons headed west for the gold and silver rushes (Pike’s Peak or Bust), and Colorado itself has a long mining history. Today you can drive to the top of the peak during the summer months for a dizzying walk in the thin air, and there is still an annual “Pikes Peak International Hill Climb” where daring race car drivers from around the world race up the mountain. If I haven’t convinced you to become a tourist yet, just take my word for it and get in the car. This painting belongs to my dad. 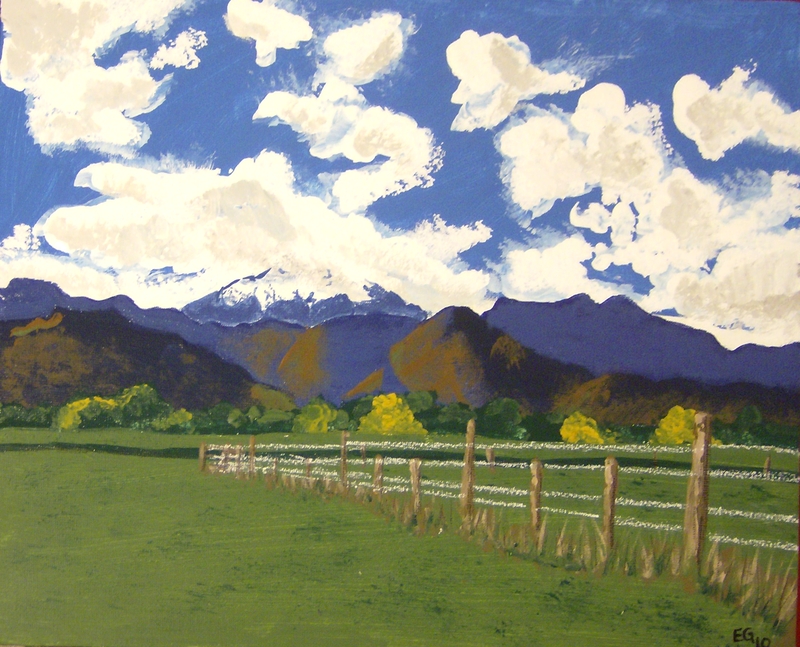 This entry was posted in acrylic, art, colorado, landscape, mountains, nature, outdoors, painting, pikes peak, rocky mountains, Uncategorized and tagged acrylic, art, colorado, landscape, mountains, nature, outdoors, painting, pikes peak, rocky mountains on June 1, 2013 by Jumping Jack Studios.